I just love black and white and I hope you will too! Instructions: Card size is 5 x 7”. Score 10 x 7” black cardstock at 5” on the long side and fold to create to fold card base. Cut mat layer from white cardstock 4 7/8 x 6 7/8”, place in embossing folder, run through diecutting machine and adhere to card base. Cut a black mat 3 x 6” and a white mat 2 7/8 x 5 7/8”, emboss white mat and adhere the two together. Adhere to the card base as shown using dimensional squares. Cut two pieces of white cardstock 4 7/8 x 6 7/8” and adhere to the inside of the card. Stamp small cupcake from Sprinkled Confetti Cupcakes Cling Stamp Set 4x on white cardstock using VersaMark ink, sprinkle with Ranger Black Sparkle Embossing Powder and heat set using the Heat It tool. Diecut two cupcakes using full cupcake die and two using topping die. 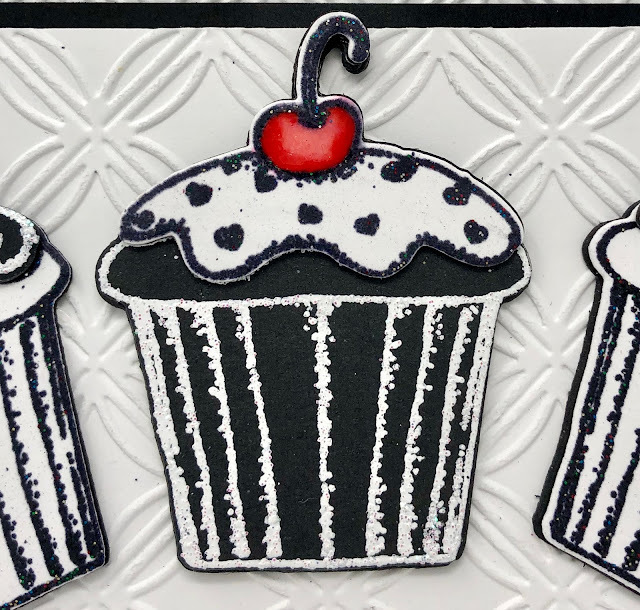 Stamp small cupcake from Sprinkled Confetti Cupcakes Cling Stamp Set 4x on black cardstock using VersaMark ink, sprinkle with WOW Sparkling Snow Embossing Glitter and heat set using the Heat It tool. 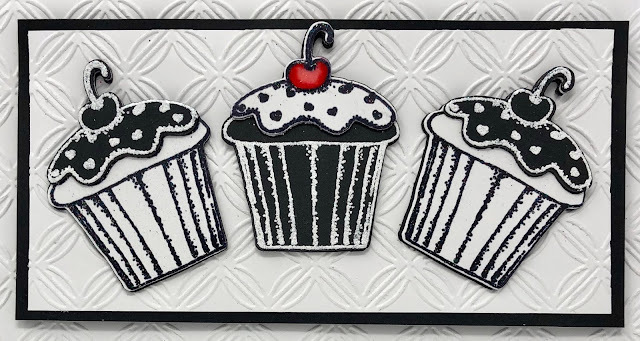 Diecut two cupcakes using full cupcake die and three using topping die. Diecut cupcake 9x from black cardstock and adhere 3 to each of three cupcakes using dries clear adhesive to create a stronger image. 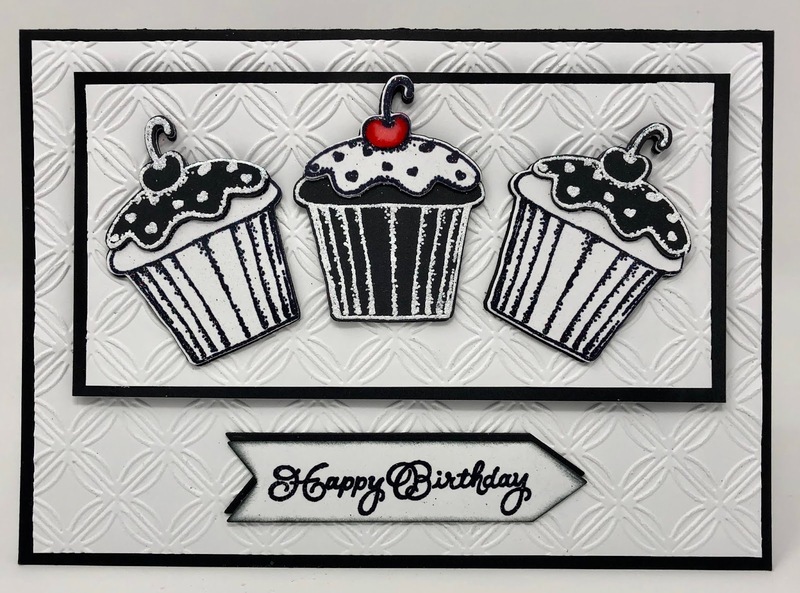 Diecut topping 6x from black cardstock and adhere two to each of three stamped toppings using dries clear adhesive. Adhere the black toppings to the white cupcakes and adhere the white topping to the black cupcake. Color the cherry on the white topping with Zig Clean Color Real Brush marker Carmine Red, color in using VersaMark pen, sprinkle with UTEE and heat set. Adhere the cupcakes to the card as shown. Adhere the 4th cupcake to the inside of the card. Stamp ‘Happy Birthday’ on white cardstock using VersaMark ink, sprinkle with Ranger Black Sparkle Embossing Powder and heat set using the Heat It tool. Diecut using second smallest Arrows and Banner die and ink the edges using Ranger Black Soot Oxide ink. Diecut a second one, the same size, from black cardstock, adhere the two together offsetting them and then adhere to the bottom of the card as shown. Have a beautiful day and a very Happy Easter! Gorgeous card. Love the black and white colours!